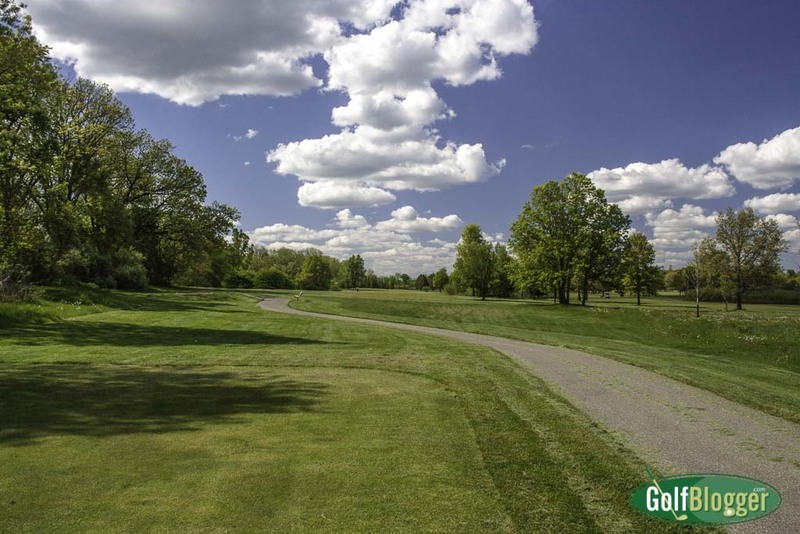 The Hudson Mills Golf Course is part of southeastern Michigan’s fabulous Metropark system—a network of parks and recreation areas that includes eight golf courses. Hudson Mills, located in western Washtenaw county, is a rather dull track. Nearly all of the holes are straight shots from tee to green, with little strategy needed. You simply hit the ball straight as far as you can off the tee, and then take another straight shot into the green. The course is also very wide open. There’s little danger of losing a ball in the woods or swamp here. I don’t miss a lot of fairways, but when I did, there was no real penalty. There are a couple of marshes, a few tree lines, some creeks and a pond, but none of them really come into play. In fact, I have a hard time imagining anyone’s ball actually finding these obstacles. The course measures in at 6,560 with a slope of 118 from the back tees. The whites are at 6,339 with a slope of 116. A couple of holes stand out only because they are different. The 13th is a par five dogleg right that cuts through a thick forested area. Here, you need to play it wide to have a shot at the green on the second. A small creek that guards the front of the green provides a additional strategic element. The par 3 16th is one of the toughest par threes I’ve played. The shot requires a carry of 200 yards to a tiny green. Guarding the front of the green is a stony drainage ditch. And although the hole is straightforward, the green on the 15th seems to have been designed by a truly evil person. It’s triangular in shape, with a back to front slope that’s as steep an angle as I have ever seen. I have no idea how you avoid having the ball roll back at you when the hole is at the apex of the triangle. Conditions at the course were pretty good on the day I visited. There were a couple of shady areas where the grass had difficulty growing;the rest was well-filled in. The rough was mostly clover, but the fairways were generally weed free. The greens were in good shape, the tee boxes a little less so. Hudson Mills is an adequate course, but with so many others in Southeastern Michigan, I can’t see putting this one on your must play list. The Hudson Mills Golf Course Review was first published August 1, 2006. Photos of Hudson Mills Golf Course follow. Hudson Mills' first is a 375 yard par 4. Hudson Mills' third is a 324 yard par 4. The fourth at Hudson Mills is a 227 yard par 3. The seventh at Hudson Mills is is a 357 yard par 4. The ninth at Hudson Mills is a 409 yard par 4.